Here is the start of a level for a sub terrain setting in a series of sewer and rail tunnel, with caves and underground spaces for looting and fighting enemies. I will not go into the story line as it is not my story. Have permission to post this stuff to get feed back and show the direction of level design we are going for. I am going for the deferred lighting system for making this stuff, so forgive my newness in the shader application. I promise to get up to speed on it. This was my first try as a whole premade building from 3d Max. Easy to get in, but I could see where having mesh physics would be a waste of resources. So this section will get split into logical sections based on collision needs. No change on the first camp yet, as the editor crashed to my newbiesness in running it. Started from a new scene and project this time to see if I can control management better of assets. Tunnel is one object with its pipe works. The factory looking space is comprised of around 15 pieces of that scene into collision logical parts and assembled in the editor. you wasted no time to get the hang of it Looks great nice and big for a fire fight. I waste not to much. Right down to the meat and potatoes on how to get existing stuff into the engine, and what does it take to make it function with no hassle for the developer. Goal number one. Yes this is ShakeyShawn's project that I am building. All of this is in reloaded and was looking good till I rendered it off in here. Now I see that my texture work is truly paying off. This is just a 20th of the intended play for this sub terrain section. Then it all goes above ground. Huge plans he has. Defiantly more to come on this one. Looking great, loving the texture quality compared to the previous engine, I will take a look around and see what all I can find out. GFX: Radeon HD 7750 1GB Edition (Fan Cooler). CPU: Intel G850 2.9Ghz (Stock Cooler). RAM 4GB Cosair. OS Windows 7/10 32/64Bit. wow! great Job. I think the end game is going to be really good. Q> Is this running in deferred or in Forward? Because there is a surprising amount of lights. Having the building animations really makes the scene work and make it believable. Really looking forward to the fire fights that could happen in that space. Have you tried changing the ambient colour? This can make the scene look even better. Yes they where both with differed lighting. The first video I did not turn down the lights or ranges, or the specular in the light settings. Second is just rough lighting and a lot less of it, with the notion that most lighting will be coming from fire sources. No post effects yet. Still into the shaders. How can I stop doing this to myself, when I crash the editor playing with the shaders? When I open the scene, the object I was messing with now is not my own any more? This has happened to me a few time, and all I could do was strip it out of the folder completely, mesh, fbx, material, and textures and re export the model from 3d Max again to get it so it thinks t is mine again. Also I was in the advance shader when it crashed in differed lighting. cool, deferred is great for many many lights. Its just terrain and directional lights don't show using it atm. Also the shaders that are applied in deferred are not the same as the ones in the forward renderer. In the material file, each material has 3 materials. "material mymaterial_adv" - This is the advanced shader and Uber shader(IBL) and is based on the forward renderer. Basic is used if this material does not exist. "material mymaterial_deferred" - this is the the deferred material that is swapped to when deferred is activated. Basic is used if this does not exist. Deferred still has much work to do and is untested to the same level as forward, aswell as having the materials upgraded. Perhaps when editing your shaders, the wrong one is being worked on? or is the advanced material being applied after a refresh? This material error will show when editing shaders, if there is a compile error in the cg, hlsl or glsl script files. This can be caused by syntax, typos, unused variables or running out of instructions. Use the "Skyline.log" and search for your script name. It should show a compile error; with the line and a reason why its broken. The list is long, but 1 shader is grouped together for errors. What I did was rewrite the material file strictly for use as differed, got my textures listed, save it, then reimported the mesh. now I just leave it alone and not mess with it. The material is showing up. Specular texture does not seem to like this mod either. So working at the moment. Seems like the best action is just to edit the materials for the differed materials by hand for the moment. OK, so no terrain shadows, and no directional lights in differed rendering for now. I got smart, and backed this file up as a copy, while I am monkeying around with seeing what I can do with it. cool np It's great to have real developers here on the forums. Those bits of particle dust really help. Very dark scene.What post FX is used for that? Are you going to be adding a torch spotlight to the gun as you move around, i think that would look great. Shawn wants it very dark so you have to use a torch. Need to figure how to attach the spot light to the weapon. This is a high priority for him. Turned on the Atmospheric scattering real low and dark blue. Layered fog activated but no height or distance setting other then 0. IBAL with ambient normal on with a color of #776e90 and the amount at 345. IBL is enabled but don't seem to be able to adjust anything there as of yet. Default shadow settings. Next is glow the globes on the lights and a little illumination for them. Task for today. Back up the material files and give it a go. Got a spot light attached to the FPS player. Tried the attach to bone one but still getting no up and down follow for the spotlight. I see the nubs listed, but I can not find the one the player cam is linked to so the light follows that instead. Next I will be playing on the glow or emission the light globes. thats moving along so fast. Well done it looks even better with the spotlight. The FPS is not attached to any bones yet. It is a simple node offset, and the arms pitch with the node. You could try using the entity offset, like the FPS is doing Save first before editing though. If this is turning into a real game, then you should add it to ModDB and link it to the skyline game engine, so it appears on the games list. You already have enough WIP videos to make the page look good. Thanks, I will talk to ShakeyShawn On how much he wants to show. It is linked in Indie DB right now under FPSC Reloaded (Game Guru now) at this link. http://www.indiedb.com/games/early-is-the-night This shows the direction he would like to take. But he like the graphics in this engine a lot better. I will give that a shot. Is there a way to attach the light to that node instead? I saw it listed in the camera property I think it was, But no show in the attach to bone action. Right now it is attach to the weapon Character arms object (Attach to object) and manually rotated into place. I am having a look at the torch now for you. Thank you. No hurry, you have a schedule of work tasks, I am sure. I have had a quick look at the system, atm there doesn't seem to be a quick way of rotating the light to the camera. This is because that FPS system was designed as a default FPS to get going with. ok, as it turns out, it was quite a challenge and it does require the next version of skyline to do as a few new lua commands were needed. ( not the gun atm, this can be done later ). Next, i added a microscript onto the spotlight, in which it contains an onUpdate() event. The function grabs the cameras world orientation(new lua command) and rotates it 180 degrees to fit the fps model. Then sets the rotation back to the spotlight, the result is a spotlight matching camera angle. When we release the next update, i will show an example of how to do it. Wow, I got to say I am very impressed at the quality of this engine compared to the one we are currently using. And what I love most about it is the amazing forum and support. We will be switching to this engine. While I may need to grab a new scripter, or take the time to keep studying LUA, as my knowledge of LUA was based around a restricted custom version. I see a bright future using this engine compared to the one we were using. One of their users pushed me away from there forum as he bashed every product except his own (He made his game to seem as if it was a gift of god and everyone elses had fault). I will not go into much detail, But I am proud to say that we will be switching to this engine to make our game "Early is the Night". 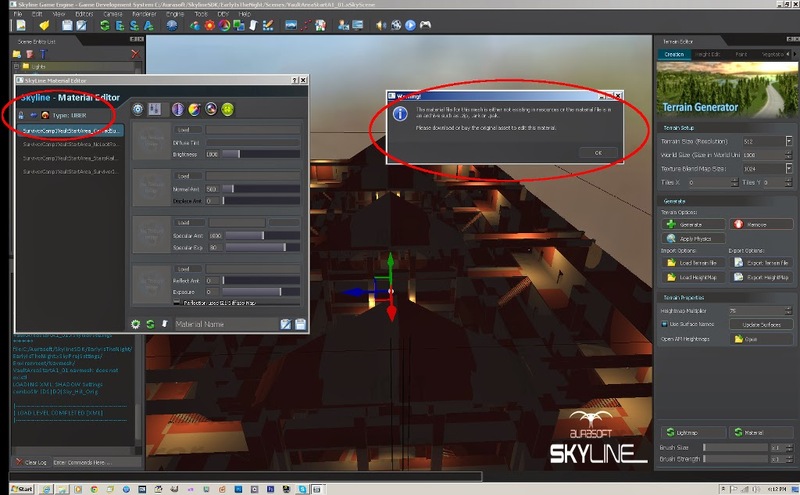 I will also switch the engine on IndieDB from Custom to "Skyline Engine". I have been busy so I haven't been able to check much out until recently. What I have seen so far looks amazing. Keep it up guys! if there is ever anything I can help out with let me know. It will be great to have another project being developed on Skyline as this will help other users to have trust in Skyline. Sorry to hear about your problems on another forum, but the minority generally spoil it for the majority. We welcome all levels of developers and hope we can all share our skills in a friendly supportive community. if there is ever anything I can help out with let me know. Thank you for your offer, we need all the help we can get in all disciplines to make Skyline a great fun development tool for all of us. Note: We would like you to know that we are in Beta so there are a few bugs and issues which will get ironed out over time. Getting one of them was painless and easy. Need to reboot my machine, to many tasks done this morning.